A few days before arriving in Ploce, they told us the watermelon was not ready. 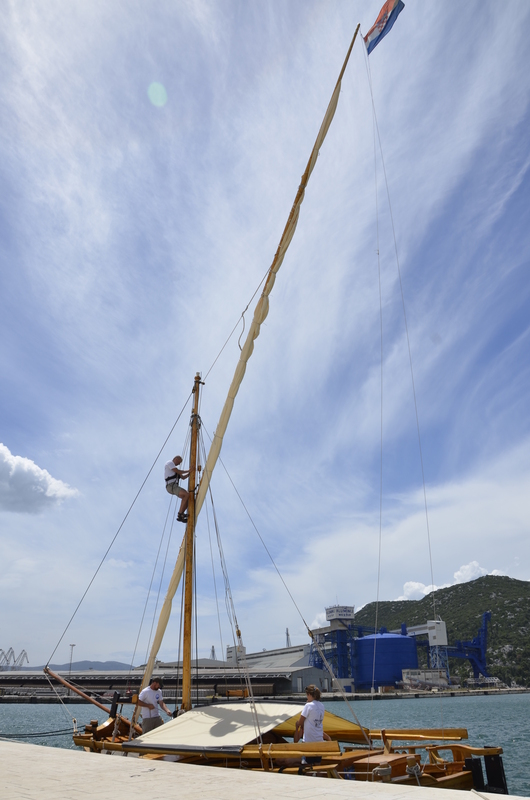 The mayor of Ploce had arranged to get them from various farms around the valley. When I called the week before, he said that he wasn’t sure because the watermelon were not ripe this year. there have been lots of rain in the month of June and they hadn’t fully grown yet. He asked if we could use another fruit like peaches, or apricots, even oranges and vegetables, but I didn’t know what to say to his kind offer but to thank him and ask if there was any way possible… because the watermelon voyage… without watermelon would not be the same. The days leading up to our arrival in Ploče, I was very nervous that they wouldn’t find them. The day before arriving the mayor’s assistant called, and to my relief, said he had heard of a farm inland that had started harvesting already. We were excited to find that between two farms, we had enough for a full load watermelon. Early that morning the students woke up and started organizing the boat so that the cargo hold would be ready. They didn’t sleep a lot that night not because of rain, or nervousness, but because of mosquitoes. Of course… in the River Delta there is sure to be mosquitoes. They were particularly bad in the evening. Luckily most of the thousands that were swarming the boat went away just leaving a few stragglers to keep the students awake on and off during the night. 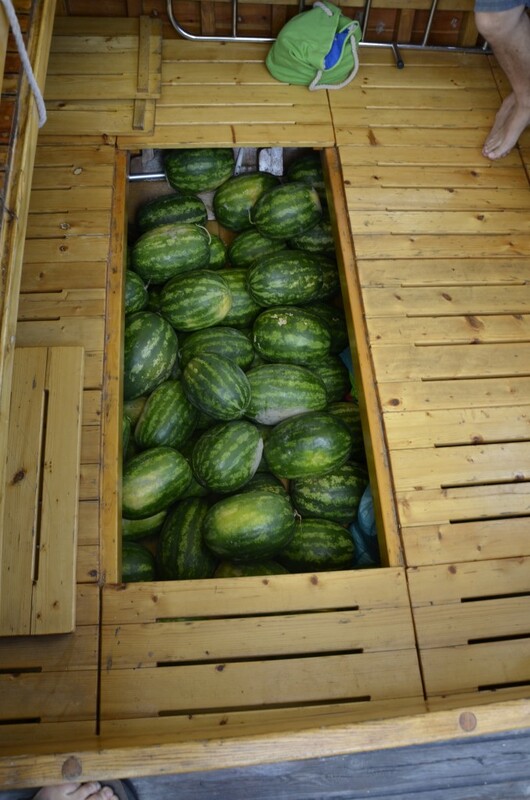 There was a steady grumble and swat that could be heard throughout the boat all night, but in the morning, the students seem to be very happy and excited waiting for the melons to arrive. 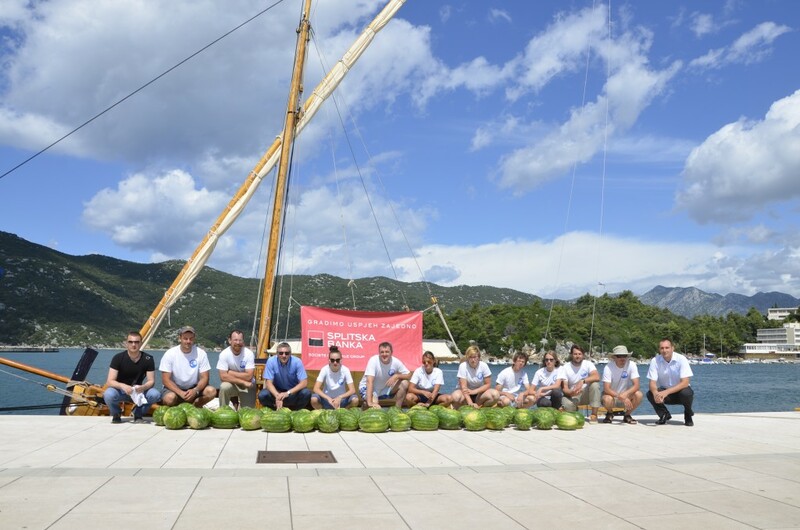 The Watermelon Voyage itself is something that people are proud of, not only on the boat, but also in Ploče. They are happy that we have come to their area and then also to share in their story about agriculture. When the watermelons arrived, the students quickly took them from the trucks and wanted to put them right in the boat, but because this was also for the city and for the media there were lots of pictures to be taken; pictures for unloading watermelon, pictures for putting the watermelon down, pictures for eating watermelon, there were lots and lots and lots of pictures, so many that the students were very tired of getting their photo taken over and over again. Eventually we started loading the watermelon in the boat. One by one we formed a chain and the watermelon went down into the hold. 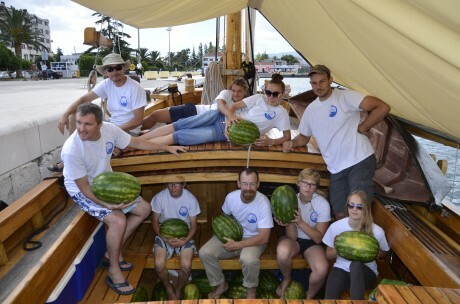 I was surprised at how many watermelons we could fit in the boat it seemed like we could take twice as many. We had the hold packed and there was still room for lots more. I can see how the bracera with its wide body is very good for carrying cargo. It is amazing to see what can be done with a boat whose design dates back to the 18th century. After the boat was loaded we cut one open. They were very good. I was nervous that they were going to give us unripe watermelon, but this was not the case. They were juicy and sweet and bright red on the inside. For me, eating an orange after all the hard work of loading cargo and taking pictures would not have been the same. 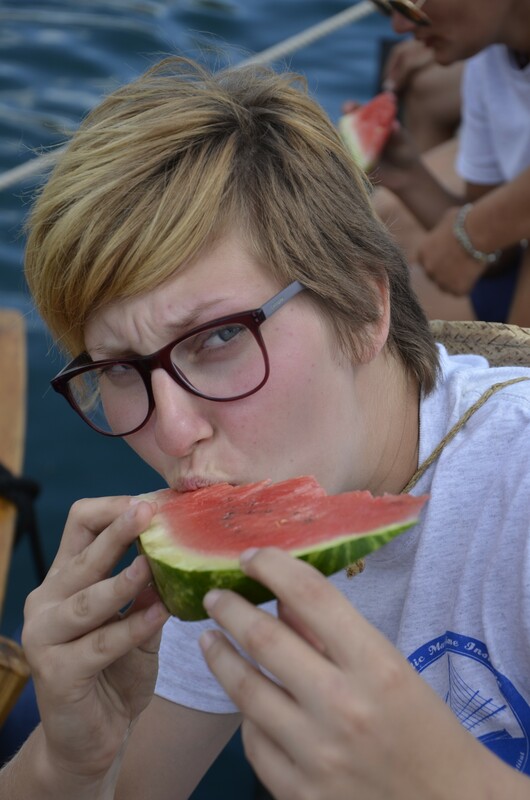 The watermelon is so refreshing in the hot summer that I can think of no better fruit that I would like to carry on a sailing boat. After the boat was loaded we headed off for a little adventure. 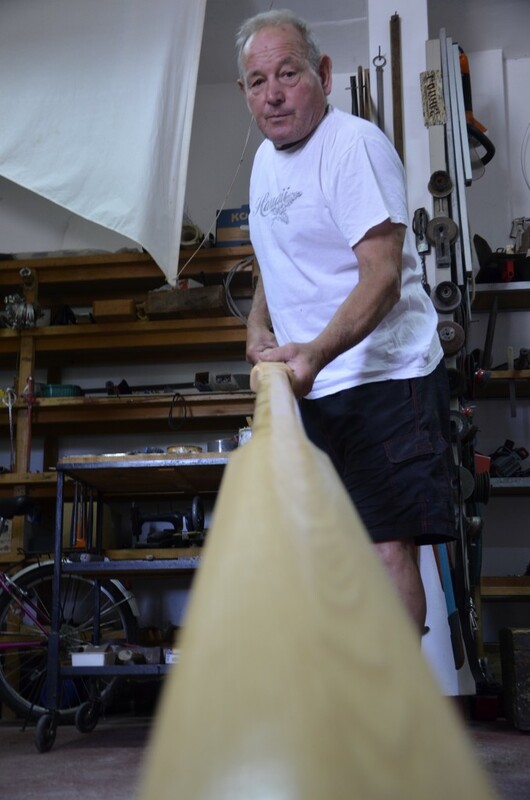 We went to go meet one of the last remaining wooden boat builders in the region who builds special types of boat for the river called the Ladja and the trupa. They are used for carrying fruit, vegetables, and all sorts of other cargo in the River Neretva. Ladja is also used in a race for from Metkovic to Ploce and runs the course of the River for 15 miles. 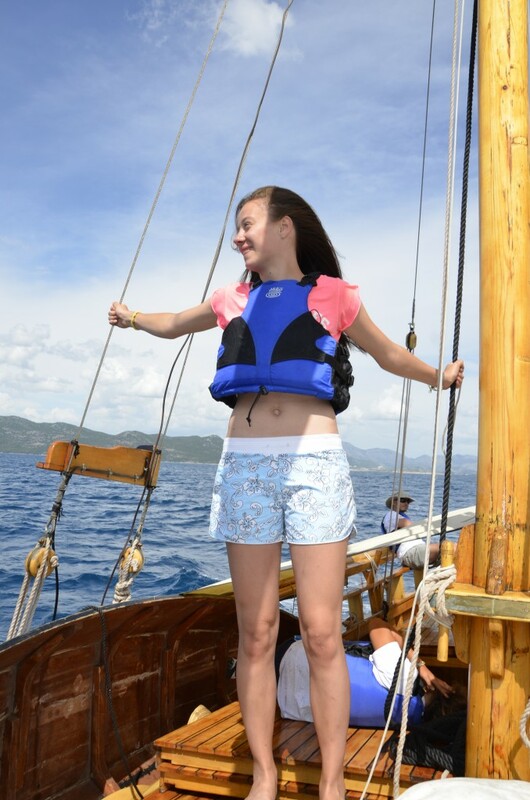 We had onboard a small trupa that we used to do different things like run to shore and set the second anchor. It was our dingy. 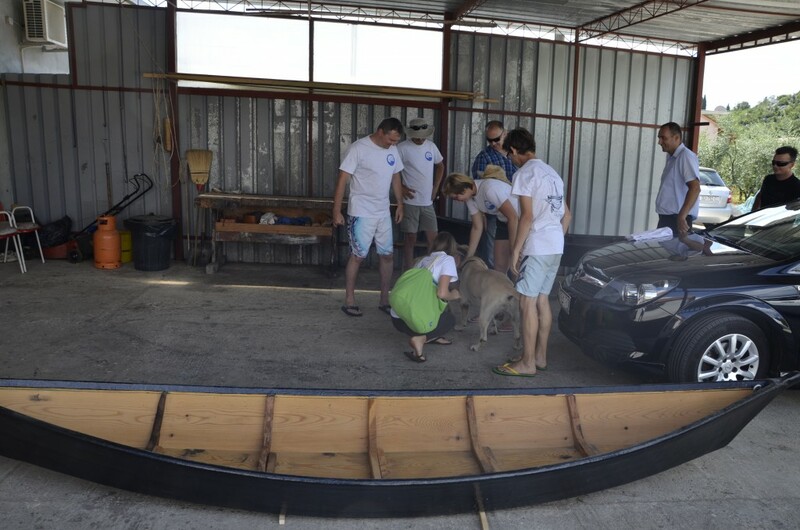 Going to meet the Ante Glamuzina, the boat builder was great for me and for the students because we got to learn about how the little trupa was made and how to properly use it. I had borrowed this boat for the trip from a friend and promised to take good care of it. Now I felt like I had the expert advice I needed. The students were very excited to learn how to paddle and to learn how to use the little boat from a master craftsman. Each of the students got a turn in the trupa which can be paddled sitting or standing. This was the original stand up paddle board. My guess is that while standing, the paddler could see over the river bank, but this is definitely unique and not easy to do in the tippy trupa. Ante showed us how they were build and the tools and techniques used by him and generations of boat builders before him. I even got a new paddle for our little boat. It was surprisingly light. After a nice morning with our new friend, we headed back to the boat for some more watermelon and lunch. We were preparing to leave in the afternoon we are all excited to get out sailing. When we left the harbor, again it seemed that there was a bit of weather on the horizon. The clouds were still far away, but the forecast was for thundershowers. We worked our way up between the mountains. On our left was the Peljasac peninsula with its rugged peaks jutting out of the sea and on our right was the Biokovo range with the tallest peak reaching about 6000 feet. It’s hard to describe the panorama that was laid out before us and the dark clouds lent to the dramatic scenery. When we got to the anchorage at Lovisce at the tip of the peninsula, the first thunderstorm was on us. The timing was perfect. We dropped anchor and rushed under the tent just before the wind picked up and it started raining. It was nice to be in a safe anchorage for the squall. We all laughed at how perfect the timing was. 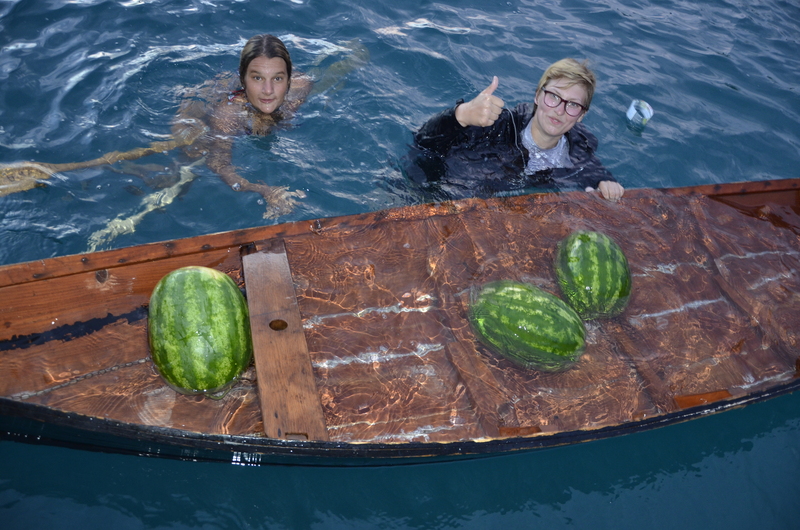 After the storm passed, we decided that we try to sell some watermelons in the anchorage. 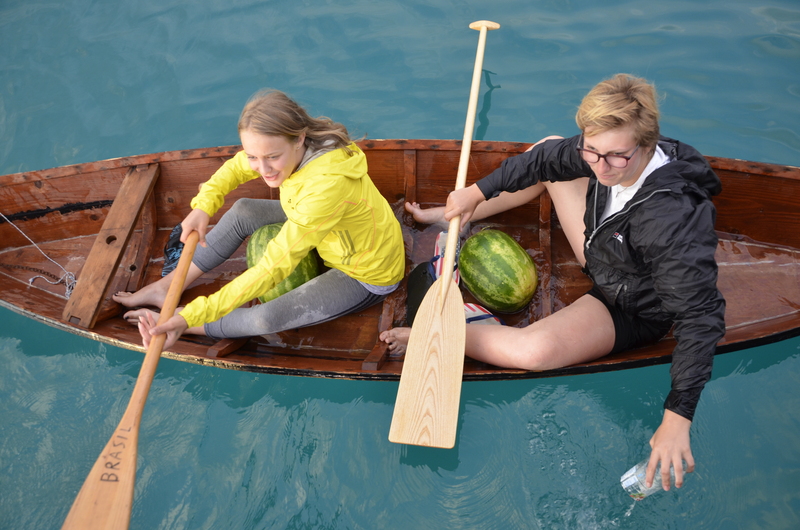 The students unloaded some watermelon into the trupa and paddled out. The sun came out and it was crisp as it is after a summer rain. 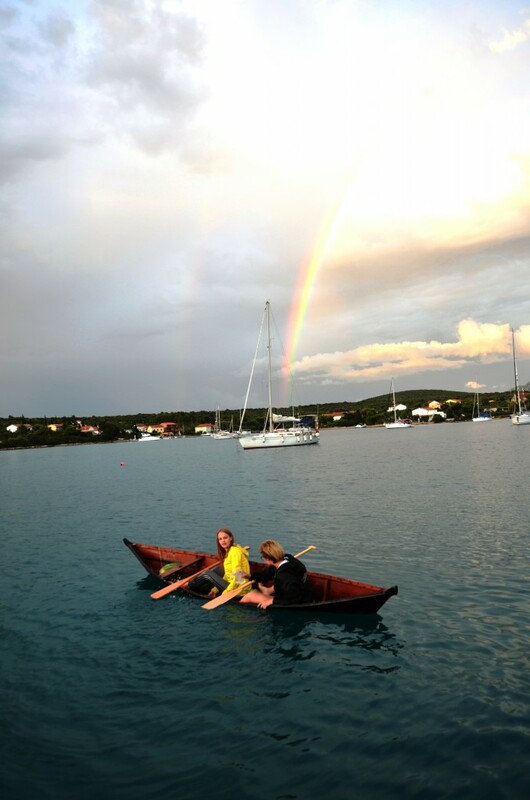 When the students were paddling a rainbow appeared. The sun, the rainbow and watermelon in the trupa made for a beautiful sight, but when they tried to paddle the trupa, they were having such a hard time. We all started laughing. It seemed they had not paid attention in the rowing class. The laughter was infectious as they zigzagged their way to the restaurant on shore with their first load watermelon. 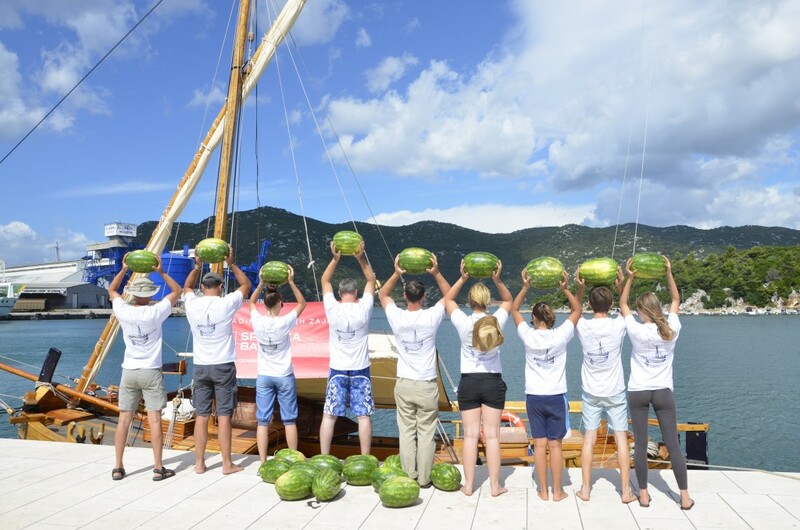 We all waited in anticipation, would the sell the melon, would they make it to shore. The trupa is the epitome of the tippy canoe. It seem as this would not end well, but they successful made it to shore, and they sold one melon to the restaurant. They ran back to the beach holding the money and we all cheered. They were very proud. Then they attempted to paddle around the anchorage to sell a few more. It seemed the boat owners were a bit timid as the girls approached the fancy yachts with the wooden boat. Some of the boat owners just gave them some money and said “we don’t need a watermelon,” as if to pay them to stay away from their boats. It occurred to me that one lesson is not enough to paddle the trupa. We would need some more practice, but for now the whole crew was almost in tears watching Kate and Maria paddle the little trupa with their load of watermelon. They returned with the money from the first sales, and at the last second they went under. The girls were swimming and the only thing left was the melon in the boat that was filled with water. When they capsized they were already at the ladder to get back on the Bracera, so they could not have been in a better place. They climbed back on board, soggy and wet, but with big smiles showing their soaking currency from their first adventure selling the fruit. In the evening, it was apparent that our thundershower was not alone. It was the first of many to come, and on the horizon were several more. As the sun went down, the sky lit up from distant lightning strikes. Eating dinner we wondered how the night would pass.